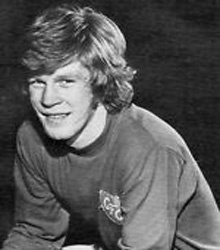 Dave Cairns (Left back, 1970-75) – Dave joined Rangers from Bowhill Youth Club in 1967 but was never given much of a chance to show his mettle at Ibrox. After a brief spell with Shrewsbury, he joined Forfar. 10 months later, he was sold to Cowden for a club record fee of £5,000. The red-haired Cairns proved an astute capture and he was a quality overlapping full-back. Davie was once said to be ‘among the most graceful kickers of a ball in the 1st Division’. He eventually became Cowden captain and Norwich City made a bid for his services. However, in 1975, he was sold to Raith Rovers. Later, Davie played with Berwick and Brechin. Then he helped out at Leven Juniors for a season as assistant to Billy McPhee and also played one game for the club. East Fife then tempted him back for a final season as a senior. Davie still lives in Kennoway and if anyone ask about his football career he always says ‘I played for Cowdenbeath. I was Cowdenbeath’s captain’. That’s what he is most proud off in his football career.